Old TV shows jog the memory. What really brings back the past is old TV commercials. The best source for these is the Prelinger Archives. Along with legally downloadable old movies, it has TV commercials and political ads from the earliest days of television, including cigarette commercials now banned from television. I go there to show my kids classic cartoons. The site can be tricky to navigate, but it is well worth it. Between Prelinger Archives and Tou Tube, I am really able to make the past come alive. One of my favourite videos is a collection of commercials for KONSUM, which was an East German department store. The commercials are from the 1950's. It is interesting that some of them allude to the economic planning and the state's efforts to make its citizens happy. In East Germany, private enterprise was not outlawed all at once. Private businesses found that their freedom to operate was illusory, that various government regulations made it a lot easier to just throw in the towel and go with the program. What made East germany unique was the fact that it shared a language with West Germany, and that both radio and television could reach into most of Eastern Germany. The auto commercials from the Soviet bloc are especially interesting as well. 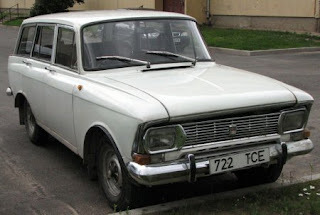 I like looking for ads for the Moskvitch, a car that would be a clunker by Western standards but had a ten year waiting list of people who wanted to buy one. Although now the former Soviet Union has free enterprise, it also has a big economic gap between those who have fared well and those who have been left behind economically. when the economy was privatised, those who had been in the Communist Party fared the best. The rest of the population picked over the leftovers. This has fueled a lot of frustration in large sectors of the population, some of whom long for the good old days in which "We pretended to work and they pretended to pay us." Today, the former Soviet Union still feeds instability, as nuclear physicists and others with strategic talents are all too willing to go to work where their talents are in demand, even if that means going to a rogue state like Iran or Libya. Perhaps the US should consider hiring some of these people, if for no better reason than to keep their talents from being of use to America's enemies.